Viewing topic "10 Best Synth Performances of All Time?????" Remember there was a discussion started last August on Motifator about who are/were the best synth players of all time? I’m now trying to finish that question with what are the 10 best synth performances on record to date? Were the performances great because the artists had good chops? Was it all about the sound and synth articulations. Were the best performances monophonic, or polyphonic? Was it all about the gear? I wonder whether the best performances will come from the best synth players. 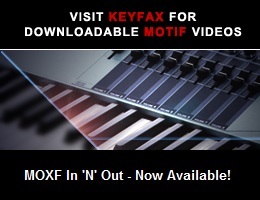 The Motifator community helped us to put together a great list of the top Synth Players. We’re hoping that the Motifator community can help us identify the top 10 Synth Performances of All time. Any suggestions? Do any Synth Solos/Performance Stick out? If you had to pick the 10 most awesome synth performances what would they be? Would they all be from the 80’s? Are any synth players setting the bar in 2018? Any and all suggestions will be greatly appreciated!!!!!! Any of this in the ball park? [...] If you had to pick the 10 most awesome synth performances what would they be? Would they all be from the 80’s? Are any synth players setting the bar in 2018? How about artists with 10 performances per album? Carlos’ “Switched-on Bach” had 10 Bach pieces. Tomita’s “Snowflakes Are Dancing” had 10 Debussy ones. I’m personally not that into traditional synth music (80s stuff etc. ), but one gotta admire this guy! Yes! we’re definitely going put some of this on the list. I had never heard of this guy, very good. He’s got to fit on the list somewhere. Very very good. Since ‘DAW-less jamming’ now is a big thing on the interwebs, there are quite a few good performances on YouTube etc. I suspect that you will need to introduce some rules to your list to narrow it down a bit since a lot of these performers may not be very good keyboard players, but still sound amazing due to sequencers. Since we all are limited to two hands (or fewer in some cases), sequencers will be a necessity for most solo performers, but should the sequence then be programmed/recorded live during the performance etc.? The idea is to try to recognize a significant synthesis performance no matter what form its in. Which is turning out to be really challenging. But the pursuit has been very rewarding so far. First there was effort to see what all of these forms of expression have in common. Are there certain basics that have to be done regardless of synthesis method? Second there was an effort to try to identify what would constitute a good synth performance. Would these synth performances represent some of the best synth performances ever?